A new leg brace has been launched in the UK to help people living with partial paralysis, spinal injury, post-stroke and post-polio syndrome walk naturally again. The C-Brace®, from prosthetic and orthotic experts Ottobock, is the only exoskeleton of its kind. The intelligent, carbon fibre brace uses a built-in microprocessor and sensors which allows the knee to control all aspects of the walking cycle and can be worn on either one or both legs. John Simpson, founder of golfing charity On Course Foundation, has today, Wednesday 4th February, become the first patient in the UK to wear the device. John has been unable to walk unaided since he was a young child. Polio left his nerves so damaged he was unable to walk and despite multiple operations, physiotherapy and treatments he has relied on a locked-leg brace to help him move around since he was 14. Today he became the first user in the UK to walk with the C-Brace, heading straight to the Royal Wimbledon Golf Club. “For as long as I can remember, I’ve had to walk with a locked-knee, which is awkward, cumbersome and puts great strain on my lower back,” explains John Simpson. “Over the years I tried new braces, supports and therapies, but nothing helped me walk and so I stuck with my original steel calipers. In all the years I’ve been wearing calipers, the most innovative development until now was the addition of Velcro, so the C-Brace is a revolution. I can walk naturally again, without fear that my leg will give way, leading to a fall. I can walk downstairs with a bent knee and without fear as the brace provides support intuitively. It’s going to change my life. With the C-Brace I’ve gone from crutches to two sticks and now only one stick, and I’m still at the early stages of learning”. 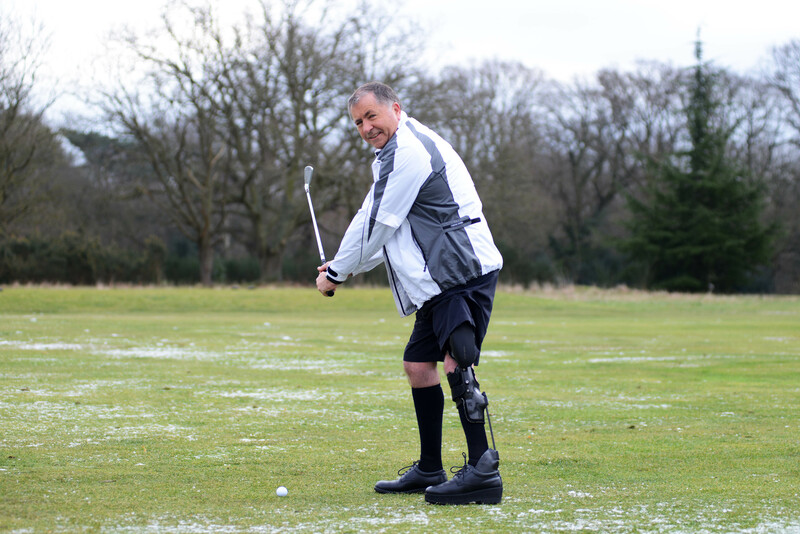 Despite his mobility difficulties, John has played golf to a high standard since his early teens – when he was taught by his father and a friend as part of his rehabilitation. John had a highly successful career as Senior Vice President of IMG, managing elite sportsmen such as Nick Faldo, Bernhard Langer, Greg Norman and Sebastian Coe and since visiting the injured military men and women at Headley Court, he has established ‘On Course Foundation’, a military charity that supports the recovery of wounded, injured and sick Service personnel through golf tuition and jobs in the golf industry. The Ottobock C-Brace can help people who have limited control of their leg/s to walk naturally, cycle, walk down stairs and descend slopes at a normal walking speed – something never before possible. Designed using world-leading prosthetic technology, C-Brace allows those paralysed through disease and trauma to benefit in the same way as amputees for the first time. “This is the most exciting development in the orthotic industry in the last decade”, said David Buchanan, Ottobock Academy Clinician and UK Stance Control expert. “This is a device designed for people who don’t have the full control of their legs or can’t bear weight without collapsing. It’s the first ‘swing-phase’ control orthosis, which means that the computer and sensors inside the device control the leg in space – just like the advanced prosthetic legs. This means that it can help people walk, cycle… even play a round of golf, naturally and comfortably”.